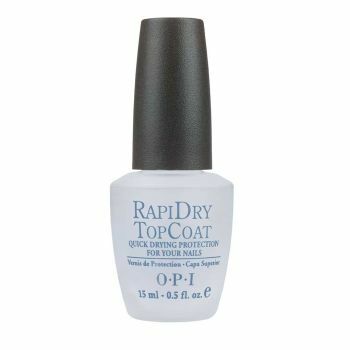 OPI RapiDry Top Coat, a clear top coat that speeds up the drying time of your favourite nail polishes. Delivering a high-shine finish that helps to prevent smears, smudges and chips in your polish, the top coat speeds up drying time of nail varnish and can even be worn alone 0 glossy sheen to natural nails. Ideal for last minute or on-the-go manicures, the fast-drying formula will dry your nails quickly and effectively for a long-lasting manicure with no risk of 'yellowing'.